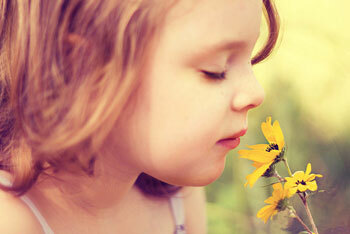 Smell – An act of respiration Every individual sets out goals that are important to him or her. Yet not one of these needs is as important as one you possess at every moment: breathing! When we contemplate the miraculous engineering of the human lungs, we will be speechless with its incredible feats. If you had been unable to breathe for a minute, you would have given up all you owned in order to be able to breathe again. In another minute or so you would have lost consciousness. Brain death would follow in another two or three minutes, and your life would be at an end. This process, which seems so simple and which very few people ever think about, is actually the first link to live . Every cell in our bodies need the oxygen provided by breathing. The beating of our heart, the movements of our muscles, cell division, thought would not be possible without oxygen. In this theme, you will see how incredulous breathing is and how each one of the systems allow us to breathe in a miraculous aspect to sustain life. Now, let's start to study the technical aspects of breathing in our way. "Let’s pause once in a while, when we are otherwise bored and idle, and think about breathing. Breathe consciously"
The two lungs are located near the backbone on either side of the heart Their principal function is to transport oxygen from the atmosphere into the bloodstream, and to release carbon dioxide from the bloodstream into the atmosphere. This exchange of gases is accomplished in the mosaic of specialized cells that form millions of tiny, exceptionally thin–walled air sacs called alveoli. Lungs are located within our chest cavity inside the rib cage and are made of spongy, elastic tissue that stretches and constricts as we breathe. The airways that bring air into the lungs (the trachea and bronchi) are made of smooth muscle and cartilage, allowing the airways to constrict and expand. The lungs and airways bring in fresh, oxygen – enriched air and get rid of waste carbon dioxide made by your cells, hence fulfilling the phenomenon of exchange of gases. They also help in regulating the concentration of hydrogen ion (pH) in blood. nasal cavity: chamber in from the nose where air is moistened and warmed. epiglottis: a flap of tissue that closes over the trachea when you swallow so that food does not enter your airway. larynx: voice box where the vocal cords are located. trachea :rigid tube that connects the mouth with the bronchi (windpipe). 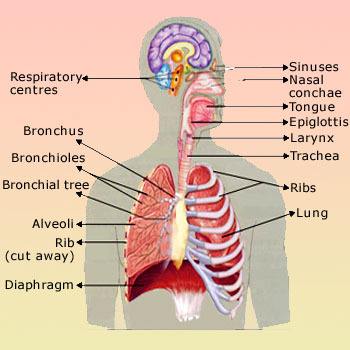 bronchus: a branch of the trachea that goes from the trachea into the lung (plural – bronchi). bronchioles: numerous small tubes that branch from each bronchus into the lungs. They get smaller and smaller. alveolus: tiny, thin – walled air sac at the end of the bronchiole branches where gas exchange occurs (plural – alveoli). diaphragm: muscle at the base of the chest cavity that contracts and relaxes during breathing. intercostal muscles: muscles along the rib cage that assist in breathing. pleural membranes: thin, membranes that cover the lungs, separate them from other organs and form a fluid – filled chest cavity. 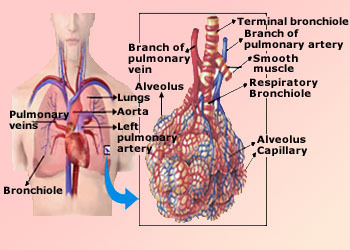 pulmonary capillaries: small blood vessels that surround each alveolus. At the bottom of the trachea, or windpipe, there are two large tubes. These tubes are called the main stem bronchi, and one heads left into the left lung, while the other heads right into the right lung. Each main stem bronchus – the name for just one of the bronchi – then branches off into tubes or bronchi that get smaller and even smaller still, like branches on a big tree. The tiniest tubes are called bronchioles and there are about 30,000 of them in each lung. Each bronchiole is about the same thickness as a hair. At the end of each bronchiole is a special area that leads into clumps of teeny tiny air sacs called alveoli. There are about 600 million alveoli in your lungs and if you stretched them out, they would cover an entire tennis court. Each alveolus – what we call just one of the alveoli – has a mesh – like covering of very small blood vessels called capillaries. These capillaries are so tiny that the cells in your blood need to line up single file just to march through them. Branching of respiratory passages The Figure represents the branching of respiratory passages and the blood circulation in the lungs. The bright red parts represent oxygenated blood and the bluish parts represent deoxygenated blood. The figure shows a small part of the lung highly magnified depicting air sacs (alveoli), the capillaries surrounding them and the connected pulmonary artery and pulmonary vein. In the human heart, the pulmonary trunk (pulmonary artery or main pulmonary artery) begins at the base of the right ventricle. It is short and wide &dash; approximately 5 cm (2 inches) in length and 3 cm (1.2 inches) in diameter. It then branches into two pulmonary arteries (left and right), which deliver de&dash;oxygenated blood to the corresponding lung. In contrast to the pulmonary arteries, the bronchial arteries supply mainly nutrition to the lungs themselves. The right auricle pumps all the deoxygenated blood received in it from the body into the right ventricle, which in turn, pumps it into the lungs through the main pulmonary artery. The pulmonary artery, soon after its emergence, divides into two branches entering their respective lungs. Inside the lungs, they divide and redivide several times to ultimately form capillaries around the air sacs. Veins arising from these capillaries join and rejoin to form two main pulmonary veins from each lung, which pour the oxygenated blood into the left auricle of the heart. Thus, the pulmonary artery carries deoxygenated blood from the heart to the lungs. It is one of the only arteries (other than the umbilical arteries in the fetus) that carry deoxygenated blood. 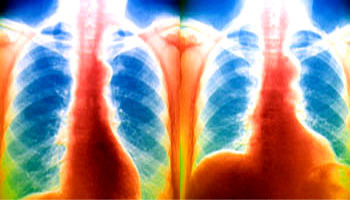 Breathing Coloured X–ray showing inhalation (left) and exhalation (right). The horizontal bands are the ribs, enclosing the lungs (dark blue). The heart is orange mass at lower right, while the diaphragm (orange) runs along the bottom. During inhalation the ribs move up and to the side, and the diaphragm contracts, moving down, allowing the lungs to expand and fill with air. During exhalation the opposite happens, the ribs moving down and in, and the diaphragm relaxing and moving up. This forces air out of the lungs, and also pushes the heart upwards. The respiratory cycle consists of inspiration (breathing in), expiration (breathing out) and a very short respiratory pause. In normal adults, the breathing rate is 12 – 18 breaths per minute. A newborn breathes 60 times per minute. It is always 4 – 5 times less than heart rate. Slight increase in CO2 content in blood increases breathing rate. Inspiration (or inhalation) is the result of increase in the size of thoracic cavity and this increase is due to the combined action of the ribs and the diaphragm. The ribs are moved upward and outward by the muscles (intercostal muscles) stretched between them, thus enlarging the chest cavity all around. The diaphragm is a sheet of muscular tissue, which normally remains arched upward like a dome, towards the base of the lungs. On contraction, it falls or flattens from the dome – shaped outline to an almost horizontal plane and thus contributes to the enlargement of the chest cavity lengthwise. As the diaphragm flattens, it presses the organs inside the abdomen and with the abdominal muscles relaxed, the abdominal wall moves outwards. When the thoracic (chest) cavity increases in size, its internal pressure is decreased. The lungs expand and as a result, the pressure inside the lungs is lowered below the atmospheric pressure. The outside air, which is at a greater pressure, rushes in to equalize the pressure. Inspiration and Expiration The various muscles of respiration aid in both inspiration and expiration, which require changes in the pressure within the thoracic cavity. Expiration (or exhalation) is the result of reverse movements of the ribs and diaphragm. The other set of intercostal muscles contract and pull the ribs down and inward. The diaphragm is relaxed and is moved upwards to its domelike outline as a result of the pressure of the abdominal contents when the muscles in the abdominal wall contract. 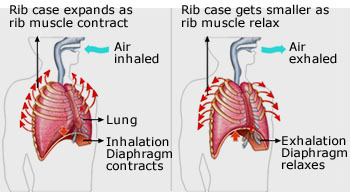 As a consequence of the above – mentioned movements of ribs and diaphragm, the cavity of the thorax is diminished and the lungs are compressed, forcing the air out into the atmosphere. 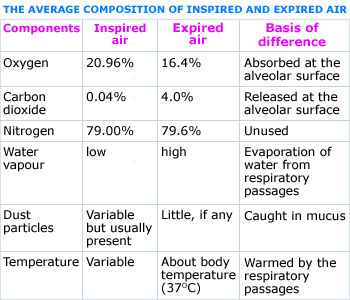 The respiratory cycle consists of one inspiration followed by one expiration. The volume of air that enters or leaves during a single respiratory cycle is called the tidal volume. Tidal volume is typically 500 milliliters, meaning that 500 milliliters of air enters during inspiration and the same amount leaves during expiration. The air inside the lungs is never replaced completely. It is always a mixture of the air left inside and the air inspired. In other words, the air in the lungs is only becoming better and worse with each inspiration and expiration. It contains more carbon dioxide. It contains more water vapor. It is warmer (or at the same temperature as that of the body). It may contain some bacteria. As you breathe air in through your nose or mouth, it goes past the epiglottis and into the trachea. It continues down the trachea through your vocal cords in the larynx until it reaches the bronchi. From the bronchi, air passes into each lung. The air then follows narrower and narrower bronchioles until it reaches the alveoli. At the time of inhaling, your diaphragm contracts and flattens out to move down, so that lungs have more room to grow larger as they fill up with air. The rib muscles also lift the ribs up and outward to give the lungs more space. The air finally ends up in the 600 million alveoli. As these millions of alveoli fill up with air, the lungs get bigger. 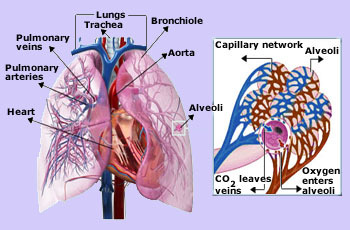 Within each alveolus, the oxygen concentration is high, so oxygen passes or diffuses across the alveolar membrane into the pulmonary capillary. At the beginning of the pulmonary capillary, the hemoglobin in the red blood cells has carbon dioxide bound to it and very little oxygen. 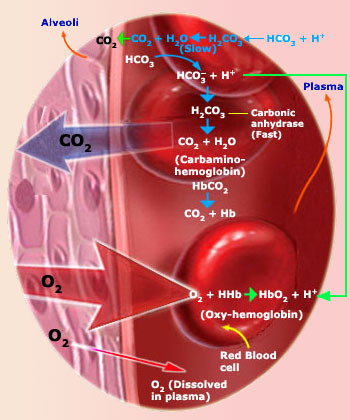 The oxygen binds to hemoglobin and the carbon dioxide is released. Carbon dioxide is also released from sodium bicarbonate dissolved in the blood of the pulmonary capillary. 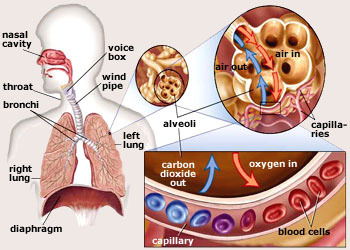 The concentration of carbon dioxide is high in the pulmonary capillary, so carbon dioxide leaves the blood and passes across the alveolar membrane into the air sac. This exchange of gases occurs rapidly (fractions of a second). The carbon dioxide then leaves the alveolus when you exhale and the oxygen – enriched blood returns to the heart. Thus, the purpose of breathing is to keep the oxygen concentration high and the carbon dioxide concentration low in the alveoli so this gas exchange can occur! With all this movement, you might be wondering why things don′t get stuck as the lungs fill and empty! Lungs are covered by two really slick special layers called pleural membranes. These membranes are separated by a fluid that allows them to slide around easily while you inhale and exhale. 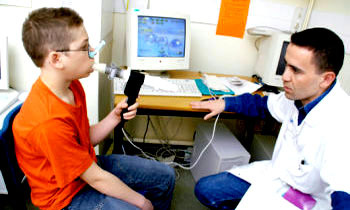 Lung function test Doctor observing an 11 year old boy exhaling into a spirometer at a hospital. The spirometer derives measurements of vital capacity, peak flow rate and forced expiratory volume. Vital capacity is the maximum volume of air that a person can exhale after maximal inhalation. These values can be used to diagnose asthma. Total lung capacity: Maximum air which can at any time be held in the two lungs = 6000 mL. Residual volume: Some air is always left in the lungs even after forcibly breathing out. This is the left – over (residual) air = 1500 mL. Tidal volume: Air breathed in and out in a normal quiet (unforced) breathing = 500mL. Dead air space: Some tidal air is left in respiratory passages such as trachea and bronchi where no diffusion of gases can occur =150 mL. 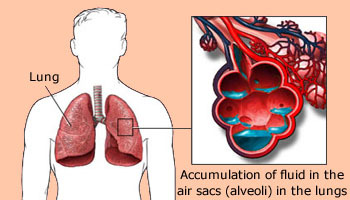 Alveolar air: Remaining tidal air in air sacs = 350 mL. Inspiratory reserve volume: Air that can be drawn in forcibly over and above the tidal air (also called complemental air) = 3000 mL. Expiratory reserve volume: Air that can be forcibly expelled out after an ordinary expiration (also called supplemental air) = 1000mL. Vital capacity: The volume of air that can be taken in and expelled out by maximum inspiration and expiration = 4500 mL. Role of carbondioxide and oxygen in breathing control The most important function of breathing is gas exchange (of oxygen and carbon dioxide). Thus the control of respiration is centered primarily on how well this is achieved by the lungs. Oxygen: Specialized nerve cells within the aorta and carotid arteries called peripheral chemoreceptors monitor the oxygen concentration of the blood and feed back on the respiratory centers. If the oxygen concentration in the blood decreases, they tell the respiratory centers to increase the rate and depth of breathing. Carbon dioxide: Peripheral chemoreceptors also monitor the carbon dioxide concentration in the blood. In addition, a central chemoreceptor in the medulla monitors the carbon dioxide concentration in the cerebrospinal fluid (CSF) that surrounds the brain and spinal cord; carbon dioxide diffuses easily into the CSF from the blood. If the carbon dioxide concentration gets too high, then both types of chemoreceptors signal the respiratory centers to increase the rate and depth of breathing. The increased rate of breathing returns the carbon dioxide concentration to normal and the breathing rate then slows down. Medulla oblongata in the brain A person&apos;s head showing the brain inside. The highlighted area shows the medulla oblongata. The medulla oblongata, or simply medulla, is the lower half of the brainstem, which connects the brain to the spinal cord. It controls the cardiac, respiratory, vomiting and vasomotor centres and deals with autonomic functions, such as reflexes, breathing, heart rate and blood pressure. Hydrogen ion (pH): The peripheral and central chemoreceptors are also sensitive to the pH of the blood and CSF. If the hydrogen ion concentration increases (that is, if the fluid becomes more acidic), then the chemoreceptors tell the respiratory centers to speed up. Hydrogen ion concentration is heavily influenced by the carbon dioxide concentration and bicarbonate concentration in the blood and CSF. Stretch: Stretch receptors in the lungs and chest wall monitor the amount of stretch in these organs. If the lungs become over – inflated (stretch too much), they signal the respiratory centers to exhale and inhibit inspiration. This mechanism prevents damage to the lungs that would be caused by over – inflation. Signals from higher brain centers: Nerve cells in the hypothalamus and cortex also influence the activity of the respiratory centers. 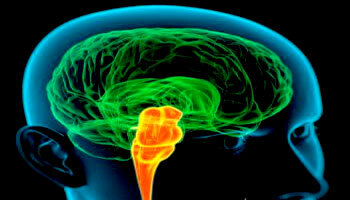 During pain or strong emotions, the hypothalamus will tell the respiratory centers to speed up. Nerve centers in the cortex can voluntarily tell the respiratory center to speed up, slow down or even stop (holding your breath). Their influence, however, can be overridden by chemical factors (oxygen, carbon dioxide, pH). Chemical irritants: Nerve cells in the airways sense the presence of unwanted substances in the airways such as pollen, dust, noxious fumes, water or cigarette smoke. These cells then signal the respiratory centers to contract the respiratory muscles, causing you to sneeze or cough. Coughing and sneezing cause air to be rapidly and violently exhaled from the lungs and airways, removing the offending substance. Of these factors, the strongest influence is the carbon dioxide concentration in your blood and CSF followed by the oxygen concentration. Control of respiration Breath control (or control of respiration) is accomplished chemically mainly using CO2 and O2 chemoreceptors. The most important chemical regulator of respiration is either CO2 or O2 since chemical regulation of breathing is different in healthy and sick people. Sometimes the respiratory centers go temporarily awry and send extra impulses to the diaphragm. These impulses cause unwanted contractions (hiccups). The same thing happens in unborn children; many pregnant women often feel their babies hiccup. This happens because the respiratory centers of the developing child’s brain are working just like those of an adult even though they are not yet breathing air. HYPOXIA is the deficiency of oxygen reaching the tissues. Hypoxia, or hypoxiation, is a pathological condition in which the body as a whole (generalized hypoxia) or a region of the body (tissue hypoxia) is deprived of adequate oxygen supply. Variations in arterial oxygen concentrations can be part of the normal physiology, for example, during strenuous physical exercise. A mismatch between oxygen supply and its demand at the cellular level may result in a hypoxic condition. Hypoxia in which there is complete deprivation of oxygen supply is referred to as anoxia. It may result due to sitting for long hours in a crowded room with poor ventilation. It may also be experienced at high altitudes where the oxygen content of the air is low. Hypoxia Oxygen therapy supplies oxygen&dash;enriched air to patients who have symptoms of hypoxia (inadequate oxygen in the body tissues). It is used to treat lung and breathing disorders like asthma, emphysema and chronic bronchitis. As we go higher up, the air we breathe in decreases in pressure accompanied by a gradual decrease in oxygen content. At about 4,500 meters above sea level, one may suffer from air sickness, in which lack of oxygen leads to dizziness, unsteady vision, loss of hearing, lack of muscular coordination and even complete blackouts. ASPHYXIATION is a condition in which the blood becomes more venous by accumulation of more carbon dioxide and the oxygen supply is diminished. This may result due to several causes, such as, strangulation, drowning or any obstruction in the respiratory tract. Death follows if the cause is not removed quickly. Artificial respiration is helpful in certain cases. The term HYPOXIA is a condition where the tissues are not oxygenated adequately, usually due to an insufficient concentration of oxygen in the blood. The oxygen deprivation can have severe adverse effects on various body cells that need to perform important biological processes. Hypoxia can be classified as local if it is affecting a specific area of the body and generalized if it involves the whole body. 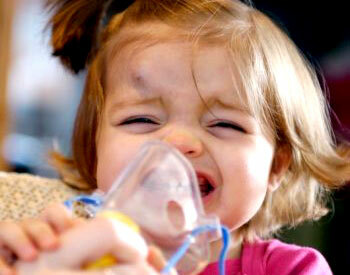 When there is a complete deprivation of oxygen supply in the body the term anoxia is used. Illustrating emphysema Emphysema destroys the walls of the alveoli of the lungs, resulting in a loss of surface area available for the exchange of oxygen and carbon dioxide during breathing. This produces symptoms of shortness of breath, coughing, and wheezing. In severe emphysema, difficulty in breathing leads to decreased oxygen intake, which causes headaches and symptoms of impaired mental ability. There are many common conditions that can affect your lungs. We will describe some of the ones you hear about most often. Diseases or conditions of the lung fall mainly into two classes – those that make breathing harder and those that damage the lungs‘ ability to exchange carbon dioxide for oxygen. Asthma: The bronchioles constrict, reducing the size of the airways. This cuts down on the flow of air and makes the respiratory muscles work harder. Emphysema: The lungs become stiff with fibers and become less elastic, which increases the work of the respiratory muscles. Bronchitis: The airways become inflamed and narrower, which restricts the flow of air and increases the work of the respiratory muscles. Pneumothorax: Air in the chest cavity equalizes the pressure in the chest cavity with the outside air and causes the lungs to collapse. This is usually caused by trauma or injury. Apnea: Breathing slows or stops under a variety of conditions. There are many types of apnea, and they are usually caused by problems in the respiratory centers of the brain. Pulmonary edema Pulmonary edema is fluid accumulation in the lungs, which collects in air sacs. Pulmonary edema: Fluid between the alveolus and pulmonary capillary builds up, which increases the distance over which gases must exchange and slows down the exchange. 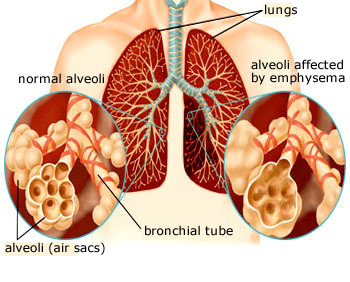 Smoke inhalation: Smoke particles coat the alveoli and prevent the exchange of gases. Carbon monoxide poisoning: Carbon monoxide binds to hemoglobin more tightly than either oxygen or carbon dioxide, which minimizes the delivery of oxygen to all the tissues of the body, including the brain, the heart and muscles. Carbon monoxide is a common product of poorly vented heaters (space heaters, furnaces, water heaters) and of automobile exhausts. This condition can be fatal if not caught soon after exposure.